Bloomsbury Publishing, 2000. First UK edition-first printing of this Deluxe edition. Hardcover. Good/No Dj cover as issued. GC plus.Bloomsbury,2000.First UK edition-first printing of this Deluxe edition.Printed in UK by Clays.Pictorial purple hardback(small marks,nicks,scratches and dents on the cover and spine,gilt lettering and illustration on the front cover,gilt lettering to the spine) in good condition plus, no Dj as issued.Gilted outer edges of the pages.Nice and clean pages with ink marks and scratches on the outer edges,three small tears on the edges of pages 583-588,two small creases on the edges of the pages,small pencil mark impression on the edges of the title page.The book is in GC with some shelf wear on the cover.636pp including the errors.A collectable first edition-first printing.Heavy book. 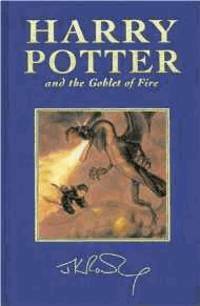 Book Description: The summer holidays are dragging on and Harry Potter can't wait for the start of the school year. It is his fourth year at Hogwarts School of Witchcraft and Wizardry and there are spells to be learnt and (unluckily) Potions and Divination lessons to be attended. But Harry can't know that the atmosphere is darkening around him, and his worst enemy is preparing a fate that it seems will be inescapable ...With characteristic wit, fast-paced humour and marvellous emotional depth, J.K. Rowling has proved herself yet again to be a master story-teller.